The Indian Metal casting( Foundry Industry ) is well established. 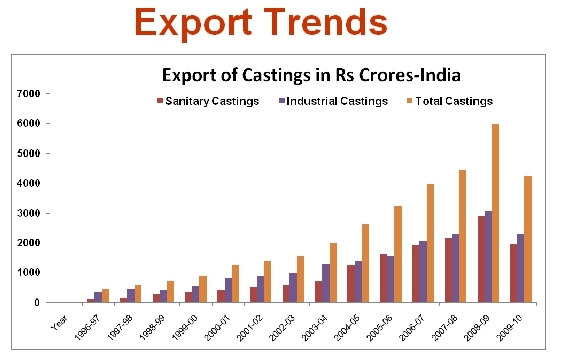 According to the recent World Census of Castings by Modern Castings, USA India Ranks as 2nd largest casting producer producing estimated 7.44 Million MT of various grades of Castings as per International standards . The various types of castings which are produced are ferrous,non ferrous,Aluminium Alloy, graded cast iron,ductile iron,Steel etc for application in Automobiles,Railways, Pumps Compressors & Valves, Diesel Engines,Cement/Electrical/Textile Machinery,Aero & Sanitary pipes & Fittings etc & Castings for special applications.However,Grey iron castings is the major share approx 70 % of total castings produced. 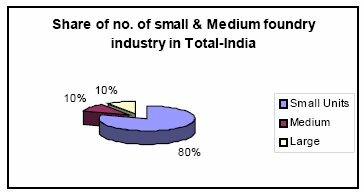 There are approx 4500 units out of which 80% can be classified as Small Scale units & 10% each as Medium & Large Scale units.Approx 500 units are having International Quality Accreditation.The large foundries are modern & globally competitive & are working at nearly full capacity. Most foundries use cupolas using LAM Coke.There is growing awareness about environment & many foundries are switching over to induction furnaces & some units in Agra are changing over to cokeless cupolas. The Exports are showing Healthy trends approx 25-30% YOY as can be seen from the charts below.The current exports for FY 2005-06 are approx USD 800 Million. Most foundries use cupolas using LAM Coke.There is growing awareness about environment & many foundries are switching over to induction furnaces & some units in Agra are changing over to cokeless cupolas. India would need approx. $ 3 Billion in investment to meet the demand of growing domestic industry and strong export drive. Delphi. Ford India, Tata-Cummins, GM and Ford have contracts of foundry products for export with a value of $ 40 Million. Since 2003 the steep increase in cost of raw materials and energy have resulted in the closure of approx. 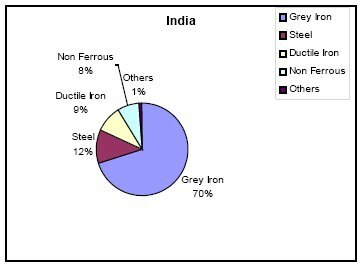 500 units, Overall India is exporter of Pig Iron but must import Scrap metals and Coke etc. Cost recovery for material and energy is very difficult as most contracts are long term contracts with out any clause for price adjustment. India has to import coke & scrap.Moulding sand is locally available & India has an advantage on this account . 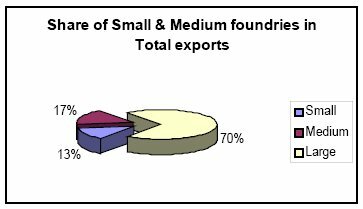 The Institute of Indian Foundrymen has plans to strengthen and develop various foundry clusters.